ZAGG has outdone itself with a new type of iPhone case. 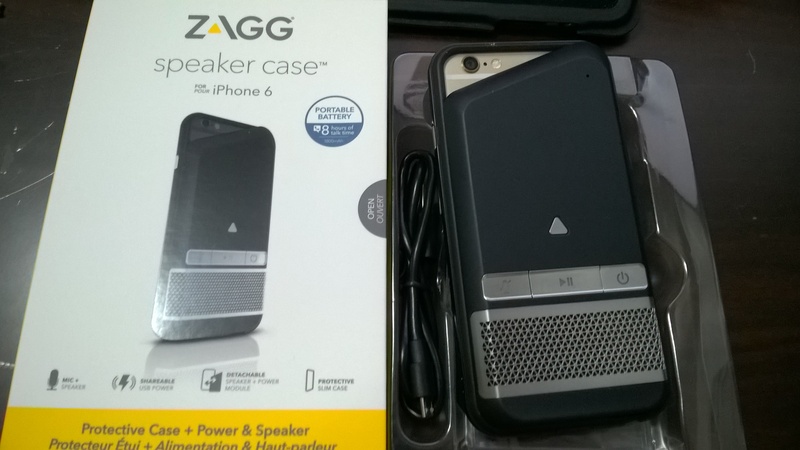 The ZAGG Speaker Case is not only that, but also a backup battery that gives you up to 8 hours of charge. The case itself is technically a bumper you put around the phone. However, there is a detachable speaker you can put on at any time. It just snaps into place and you are off on your adventure. The bluetooth speaker is solid, with 4 different buttons on back. A power/bluetooth discover button, a play/pause button and a mute button. The speaker is on the bottom and is covered by a grate pattern. The microphone on top allows for you to turn this into a conference call – all while the phone might be sitting on its charger across the room. I did say four buttons, right Captain Picard? The Triangle button is the battery indicator. This is so you know how much charge you have left not only for the speaker, but to charge your phone. The bottom of this device has a USB micro to charge from the wall, and a USB port to plug the lightning cable (or another cable) into the phone. The speaker is also an 1800 mAh battery to give you up to 8 hours charge, if you are not using the Bluetooth speaker that much. First of all, this is only for iPhone 6. No word on if a 6 Plus or other model will be available. I would guess so and you would get a different type of bumper case for it. A big downfall is the use of the micro-USB connector instead of a lighting connector on the speaker. In order for me to get full charge, I have to carry around two different cables. What is worse, to use the charger for the phone, you have to bring along your lightning cable. It would have been nice if there was a side-attached cable to plug in. If you use 3rd party Lightning cables or headphone cables, the access ports might not allow you to plug in. The bumper case doesn’t give much opening for those types of cables. So far, the charger doesn’t separate from the case while in my pocket. I would guess the bumper case will eventually wear and this will become more common. The speaker/battery will double the weight of the iPhone. Of course, any charging case will also do that. The ZAGG does need a little getting used to when you are holding it. After about a day, the phone will get somewhat comfortable again. You don’t always need the battery/speaker attached all the time. It could easily go into a bag or leave at home from time to time. The best asset is simply the combination charger and Bluetooth speaker. You can connect up to and charge any device – iOS, Windows or Android. Even when new phones come out, I could see this device in my bag as a spare battery/speaker.